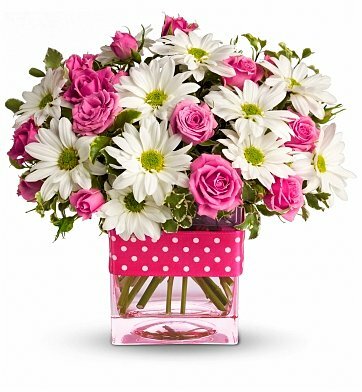 Pink roses and snowy white daisies are poised in a stylish pink glass cube vase. Decorated with a pretty ribbon, the bouquet makes a cheerful gift and the perfect gesture to brighten that special someone's day. Lush Greenery, Satin Ribbon, and more. Polka Dots & Posies is a hand delivered gift. These gifts are delivered by one of our local design centers located throughout the United States and Canada. Same day delivery is available for most gifts when ordered before the cutoff time. The cutoff time for Polka Dots & Posies is 2 PM in the recipient's time zone. I live in VA and my grandma lives in RI. I was able to get her some last minute flowers for her birthday the same day and they looked great! She loved them so much and the customer service from this company is amazing. I highly recommend them for same day delivery and great prices on all their arrangements. Love love love. Will shop here again! Flowers were delivered on the same day ordered, in fact -in a few hours. My daughter was very happy and had gotten a lot of compliments on how pretty the arrangement was. More than I expected. Thank you! I had a rough experience @ Christmas week. So, I was going to give them a 2nd chance. The arrangement was off the charts beautiful. Arrived in a timely manner! I absolutely love the Customer Service folks! Top Notch! Thank you for making my friend's birthday wonderful. The flowers were ordered for my daughter in college as a surprise, thinking about you gift. They were delivered on the scheduled date at a reasonable time. They looked pretty much as pictured, only difference is the roses were a lighter pink than what was pictured. Overall this was a beautiful arrangement. I would definitely recommend to others. 5 stars from me! The flowers arrived on day promised and recipient says they were beautiful. That's all I can ask. A former student of mine is battling cancer. As she faced her first treatments, I wanted to brighten her beautiful face. Her dad said it did just that! Thank you. My sister just gushed over this presentation. Nice presentation and delivered as promised the same day as I ordered. Our daughter was delighted with the bouquet. Many of the flowers were just budding out so she knew they would last a long time. Excellent customer service when I had to change the delivery date. The flowers were delivered on time and the recipient loved them. My [grown] daughter and I were at odds about something and there was great tension between us. I decided to break the ice and send a "peace offering". This little number was just what was needed to do just that. It completely made her day, melted her heart, and hit the reset button for us. There's something about pink. And polka dots. And daisies. When you put them all together in a contemporary presentation like this? I was impressed with how quickly these were delivered (within hours of ordering) and at a price that cooperated well with my budget. I ordered the polka dots and posies arrangement to be sent to the hospital where my granddaughter was born. I called around noon, never expecting a delivery that very day. Not only were they delivered within a few hours of placing my order but they were fresh and plentiful. So glad I found this florist online and will definitely use them for future purchases. I ordered this bouquet for same day delivery and had it sent to my friends in another state as a welcome baby bouquet. They loved it! I will use this service again. Thank you! The recipient appreciated and enjoyed the flowers. She took them home from the hospital and will use the polka dot vase afterwards. Your flower arrangement and delivery service was much appreciated. Flowers were well received and on time. The delivered Polka Dots and Pansies was adorable and looked similar to the picture on your site. My friend was very pleased. I will definitely use your service again. Thank you. I'm so glad this arrangement was available! and at a economical price. It's very beautiful and just the ideal Bouquet for me to express to my Sister even though I couldn't be there for the Luncheon and Fashion Show. "I'm thinking of you" during breast cancer month. It was great! I've never done anything so easy and so perfect. I've already recommended you to friends! The flowers are beginning to die, but they lasted two weeks. They were very cute, square clear vase which I love cause it is so different and holds shorter flowers beautifully (I like shorter). I would recommend and definitely send again. Ordered these flowers over the phone. The Rep was helpful over the phone to help decide what to get for my daughter. She is completing her NCLEX exam for nursing! She said the flowers were beautiful. I received a delivery and order confirmation! I didn't see the flowers, but I was told they were beautiful. They really cheered up someone in the hospital. Flowers were delivered on time and were nicer than expected. My Mother loved them! My sister n'law simply loved her birthday gift of these gorgeous flowers. My daughter loved them. I went with the slightly larger bouquet and red roses were added. She sent me a photo via text and I was impressed. Thanks for making my birthday gift to my daughter special! The office manager we sent it to said it made her smile every time she looked at them. I was out of town so I sent her flowers. I did have to call because I paid extra for early in the day shipping. They got them delivered right on time luckily. The guy that delivered gave her a hug when she said it was her birthday, it was really cute. My family caught it on camera. I would order again. Good customer service. She said it was BEAUTIFUL!!! We were sending this arrangement to someone in the hospital. Her favorite color is pink. She loved it. This was just the right touch! The arrangement was beautiful and my daughter loved it! It was a last minute gift and was just perfect for the occasion. Mother's Day for my friend's Mama. She was so happy and has never ever seen flowers like that before. It was so fresh and so pretty. I was so satisfied. I really appreciate your company. Such an easy and hassle free way to send get well wishes quickly. The flowers got to my friend when I couldn't be there. Thank you! They were beautiful!. Would highly recommend you as a service provider. I was nervous ordering online all the way from New Zealand. But you made it easy and the flowers were delivered right when I asked them to be and my Aunty adored them. You are now my go to flower shop. Thank you. The flowers were beautiful. They were delivered to my daughters' work in Memphis, TN within a few hours from when I placed the order from Indiana. It was her 25th birthday and they added to the excitement of her day. She was thrilled to receive them and couldn't stop saying how beautiful they were. I would definitely use this florist again. These flowers were sent as a Mother's Day surprise. The arrangement was very beautiful and arrived at the time promised. The arrangement was not exactly as pictured, but had the same look and was actually a little prettier since they used a variety of similar flowers. My sister loved the flowers. Every order I've placed has been well-received and many compliments on the arrangements. Sent to my daughter as a get well/mood "pick-me-up". My daughter was thrilled with the flowers. Highly recommend. EVERYONE Should Buy from this Florist! This was by far THE best experience I've ever had (and I'm 65) in ordering flowers online! First off, they were delivered to our Mom at just the right time on her Birthday! She raved about how beautiful they were and how she loved the arrangement. Second, they was in communication with me every single day from the day I ordered them until the day they were delivered! I never wondered if they would get there on time. What a joy and stress-reliever! I'll be calling you again. I bought this for my mother for her birthday. The price for this arrangement was lower than that of FTD or Proflowers. My mother took a picture of it and it looked beautiful. She was very happy. I am always hesitant to order flowers since I live in another state. I am pleased to say that I will be a returning customer. Beautiful Flowers -- Amazing Service! I am so thrilled that I chose to order from this site! I ordered flowers for my mother-in-law who was briefly hospitalized. I requested a home delivery, but unfortunately her hospital stay was extended. When the delivery man found she wasn't home, he called her and delivered them right to her hospital room! Now THAT is astounding service. It brightened her day, the arrangement was gorgeous, and I couldn't be more pleased with this company. I will definitely order again. I understand from my relative that this flower arrangement is quite beautiful and made her feel good. Thank you from a sender that you did such a beautiful job. I was reluctant to order flowers. I always heard the florists were so expensive. My Auntie is 90. After experiencing hospitalization, I wanted to send her flowers. My father (her brother) always said "I would rather have a flower when I am alive than a truck load when I'm dead". So I found this web site, hit the send button. Auntie called and said she has NEVER had such beautiful flowers! She said "I don't know what florist you used, but keep using them!" So the recipient basically made this review! Thanks! Delivery was made as requested and the recipient said they were beautiful. This was the first time using this company and I will use them again. I needed to call customer service in order to change the delivery date from Valentines Day to the day previous as I learned the recipient would not be available on Valentines Day. The CSR could not have been more helpful and responsive. My aunt loved the flowers and thought the vase was beautiful. My cousin also said that they were fantastic and they were a great addition to my aunts room. When the recipient wasn't home they made a second try the day after. GREAT service! I cant express enough how much confidence I have in this website/service. I ordered these flowers for my sisters 21st birthday. Got to her in less than 12 hours. From the photo, the arrangement looked amazing, delivery seemed to be flawless. Thank you!!!! Recipient liked the flowers. Thank you for your quick service. Fresh Cheery Get Well Flowers! I sent these to a 23 year old hospital patient who said they were beautiful! Ordering was very easy and delivery was tracked! If you need flowers to send to cheer up a friend, these are great! My wife loved the flowers and they were really well put together. The service was fast and really easy to use. Perfect Product and they loved the arrangements. Your great and the delivery was perfect. The flowers were very beautiful and had a wonderful smell!!! Flower arrangement was beautiful and the perfect birthday surprise! Arrived fresh, on time, and the presentation struck just the right note for a teenage girl's opening night. I hesitantly ordered these for my Mother. It was the first time I'd ever ordered flowers online, and honestly I was scared. I didn't get to see them, but this is what I've been told.... "They're absolutely gorgeous and they have lasted longer than I'd expected them to. " As far as the ordering process, it was quick and very easy. I needed them delivered same day and I doubted that it would happen. But sure enough, a couple hours later, they had been delivered to my Mom. This was a great experience and I would highly recommend this site/company. The Flowers were outstandingly beautiful and last a long time! Awesome. We sent as a recovery/get well and it was cheerful! Everyone loved it! I ordered late and it was delivered the next day. Very pleased! Thank you so much for your great service and our daughter loved her flowers! With our daughter living out of town it is so nice to have a florist there we can count on when we need them! We will certainly be using your services again! My sister was in the hospital and she was so happy to receive these beautiful flowers! I think they have contributed to her speedy recovery. I was pleased that you were able to deliver this birthday gift on just a day's notice. The flowers were nice and we received a call from the recipient when they arrived. It makes the coworkers jealous! Larger and more beautiful than expected. Bought the stepped up version. Also paid the extra for early delivery. The flowers were there before she arrived to work! Our 3 year old granddaughter sustained a slight injury requiring stitches. We sent flowers and balloons to congratulate her on her bravery getting stitches. She was surprised and delighted with the gift! Extremely prompt service and the floral arrangement was beautiful. Definitely would use again. I send a lot of flowers, so I can appreciate great customer service. The recipient was absolutely thrilled with the flowers. In fact, she was so pleased that she said she would use this florist in the future. That's a pretty good recommendation. I love simplicity, nothing pompous. This arrangement was simple yet beautiful, expressive and elegant. I sent this to my Mom for her birthday and she loved it. It arrived by noon on the Saturday of her birthday and, a week later, is still beautiful. This is the second time I have used this company to send a gift. They have done great both times! The flowers were beautiful according to my sister-in-law. She was in the hospital recovering from a hip replacement and it was just the pick-me-up see needed. Thank you for being so prompt with the delivery. I will definitely use your services in the future! I sent this arrangement to a friend who was in the hospital receiving chemo treatments... I had a difficult time picking out the right arrangement and the customer service person assisted me in choosing the right selection for my friend. When my friend received them, she said these flowers were beyond gorgeous and brightened her day... she was so excited she was able to take them home to enjoy them as well! I would highly recommend this company. Their flower arrangements are amazing (especially for the price). In addition, their customer service is truly exceptional! The flowers were fabulous, they got there on time and my daughter was delighted. I live in Toronto and my daughter is in Los Angeles and they really made her birthday great! My delivery was scheduled for the local hospital however when the flowers were delivered the patient wasn't there. I gave them a new address and they took care of everything. SO THANKFUL! I sent this to my sisters for Easter. It was just lovely and they are enjoying them very much. You went out of your way to get these delivered! They were for a girl that had lost her Mom Dad Brother & His Wife and two nephews in the Oso Mudslide. It gave a smile to her if only for a day! There flowers were ordered for a co-worker who was out sick. They arrived when they should have and we were told they were Beautiful. I would order again. This was an easy process. I ordered this flower arrangement for my daughter-on-law for her birthday and she loved it. She sent me a text picture and they were beautiful. Also, I had to speak with your customer service to correct the address and they were very nice and professional. My sister in law loved the flowers! I will buy from you from now on! The flowers arrived the same day my twin sister was discharge from the hospital. The flowers got there before she did. It was a nice surprise. She loved the flowers. She said that the flower arrangement was so beautiful and it made her day. Thank you. I sent this bouquet to a sister in another part of the country. Ordering could not have been easier, and it was delivered to her office without any problems. The arrangement was gorgeous - and reasonably priced. Her colleagues were so impressed, they wanted information on this site for their own gifting in the future. Made her day! I ordered this gift from Mexico for my girlfriend who was in California at the time. She loved it! It's a great gift. I only wish it would've been delivered a little earlier in the day, but still it's a five star deal. A wonderful gift to give a special person. Beautiful packages. I like your service and courtesy which appear to be the signature of your business. I encourage and will recommend your company to others. I sent this bouquet to my mom with 24 hours notice. She loved the colors and it was bigger than I expected for the basic one. Was delivered to a friend who was celebrating a big milestone in her life. It literally brought her to tears. The flowers were exactly as described and presented on the website. Did not scrimp on the flowers at all - it was a full bouquet, and the flowers were gorgeous. Professional service at a great price. Would recommend to anyone. Beautiful and uplifting arrangement, but mine did not come with the polka dot ribbon which was the key factor in my order.. I was dissappointed for that. I sent this to my daughter after an emergency surgery & she thought it was perfect. It arrived exactly when it was supposed to and cheered her up. The flowers were loved by my mom. But they were not exactly like the one shown in the photo, the flowers were red and the foliage another. i did not see it since it was sent to a friend, but she said it was beautiful. I purchased this arrangement for my daughter's birthday... it arrived on time and she loved it! Thanks for the great service!